Remain at the scene of the accident. It is important for all the people involved in the auto accident to stay at the location, especially if anyone has injuries or if it was a fatal accident. If you flee the scene after an auto accident you may receive criminal charges. Check everyone involved for any injuries. First, check yourself and your passengers if they have been hurt and contact ambulance for medical treatment if that have been injured. It is important to not move anyone that is complaining of back or neck pain. You could cause further injury if you move them. It is advised to wait until medical professionals arrive at the scene for help. Call the police or 911 as soon as possible. The police should make an accident report and you should receive a copy of this report. It is a good idea to write down the name and badge number of the police officer, for future use if the case goes to court. Take plenty of pictures at the scene. 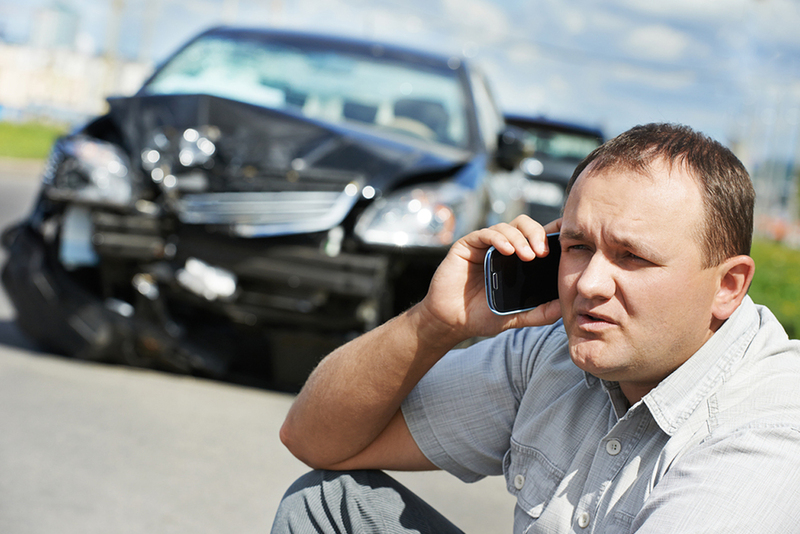 Recording the accident scene is essential when filing an insurance claim or even a future lawsuit. If possible, take pictures immediately after the accident occurred in order to get the best idea of the scene the moment it all happened. If this is not possible, return to the location as soon as possible to take pictures. Remember that the larger the time gap is between the accident and the taking of the photos, the less helpful the pictures will be to your future case. It is imperative to take pictures of the damage to your vehicle and be prepared to provide photos of your car prior to the accident, undamaged. You should also take thorough pictures of injuries you or your passengers sustained from the accident. Exchange the proper information with the parties involved in the accident. Retrieve as much identification about the people involved as possible. We recommend you gather their names, phone numbers, driver’s license numbers, license plate numbers, and insurance information. It is good to keep your conversations very limited with the other parties, so as not to admit guilt. Do not say “I didn’t see you” or “It was my fault”, simply tell them “I’m sorry”. Collect witnesses to the accident. If there were any eyewitnesses that remained on the scene, talk with them to gather their view of the accident. Write down their name, phone number, and address if they are needed at a later time with the case. Call your auto insurance company. If you can, contact your insurance rep as soon as possible. It is important to be honest with all the details of the accident when reporting to your insurance company. Lying about information to your insurance rep can result in a denied claim. It is wise to consult with a personal injury lawyer before making any official statement to anyone. Maintain records of any medical treatments received. The injuries from the auto accident can entail many treatments and follow up doctor appointments. You may need to seek treatments by your doctor, Dr. Miriam McParland, physical therapist, and other medical professionals. When presenting your medical expenses in court, it is advised to have kept track of all doctor visits, recommendations, and treatments. Keep track of your injuries. At Integrated Health Solutions, we suggest you keep a daily journal to write down how you are feeling and how you have improved since the accident. Note how the injuries, pain, and symptoms have affected your life now. It is important to jot down any tasks you used to be able to complete before the accident but cannot perform now due to the impairment from the accident. Seek legal guidance from an accident injury lawyer. Consult with a knowledgeable attorney in your area that can offer a valuable defense if you happen to be at fault or help you receive the best settlement payment for your injuries. Car accidents can happen anywhere. If you find yourself in an auto accident, it is wise to remain calm and follow the steps above. If you have any questions regarding your chiropractic care, call your Orland Park chiropractor at 708-403-5075 now to help you through recovery so you can get back to enjoying your life!